Nova Launcher Prime, the best homescreen app for Android, is currently on sale on Google Play. The app, which recently celebrated its 5th birthday, was updated to version 5.0, and brought several features from Google's Pixel Launcher for Android 7.1 Nougat to older versions of Android. This includes Swipe to open the app drawer, the new Google search bar aka the G logo widget, Android 7.1 Launcher Shortcuts (app shortcut actions). Nova Launcher Prime offers special features such as Gestures with customizable actions, Unread count badges for WhatsApp, Telegram, Gmail, etc, Scroll Transitions, and more. Normally, Nova Launcher Prime costs Rs. 330 or about $4.99, but you can buy it for Rs. 10 on the Google Play Store, in India. That is a massive 97% discount off of the original price, and there is no reason not to buy it. In the U.S, you can get it for 80% off at $0.99. The discount is also available for other countries, and according to the developer, it is set to whatever the lowest price, which Google allows for that region. Oh and the app now has a new icon, which you can see in the screenshot above, and here is the old icon for reference. 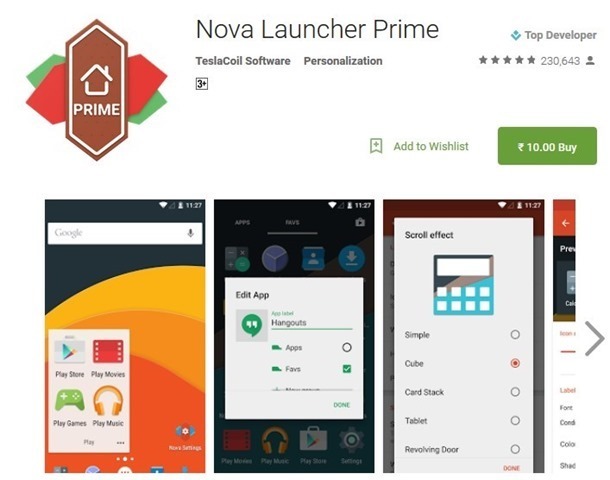 The Nova Launcher Prime sale will run until January 1st, 2017. Give the Free version a try before you decide to go premium.